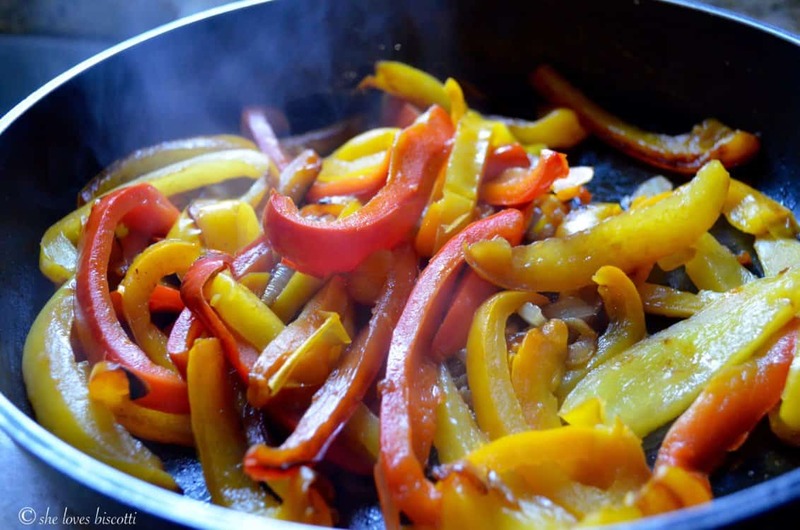 Peperonata or Italian Bell Pepper Stew is a traditional Italian recipe where bell peppers and onions are simmered together to create a tasty dish. This family recipe for peperonata can be served as an appetizer, side dish, sauce for pastas, pizza topping or snuggled in a sandwich. You won’t believe how easy and versatile this peperonata recipe is. I’m so happy to be sharing this peperonata recipe with all of you! This bell pepper stew recipe is one of the easiest ways to take advantage of the sweet bell peppers that will soon hit the local farmers market. The wonderfully fragrant and tasty bell peppers make this a very addictive dish. Its versatility is another big point in its favor: it can be used as a side dish, accompanying meat or fish; as part of an appetizer line-up; a topping for a bruschetta or snuggled in a sandwich! It’s pretty easy to make, too – just a few simple ingredients that work wonderfully well together. Are you ready to get started? Let’s start making this fantastic peperonata recipe by sautéing some onions. Once they begin to soften, just add some garlic, and the sliced bell peppers. Reduce the heat to low, cover and let it slowly cook for about 10 minutes. No need to stir, just give your peperonata a couple of shakes so that the onions don’t stick to the bottom of the pan. Once the bell peppers have begun to soften, it’s time to add some red wine. Let it all reduce, uncovered, for about 10 minutes or so. Feel free to pull them off the heat if you prefer your peppers to have a little bit of a bite. Finally, add your herbs and adjust your seasonings. This Bell Pepper Stew Recipe can be served warm or at room temperature. In fact, the flavor gets better the longer the bell peppers sit together. As far as the health benefits of bell peppers go, they are a super food! Among other things, they contain anti-oxidant flavonoids which helps the body combat free radicals, and when eaten raw, they are a wonderful source of Vitamin C (another beneficial antioxidant). Bell peppers are also low in calories. 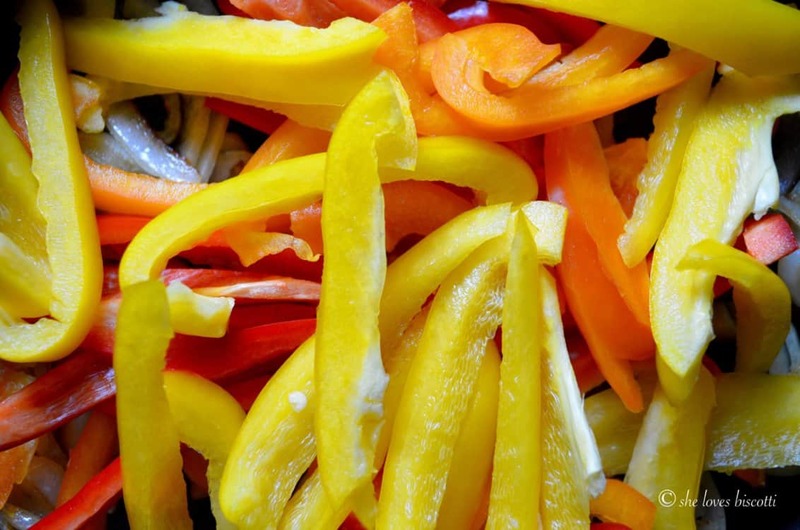 One full cup of chopped bell peppers is only about 45 calories. All in all, a wonderful food to incorporate in your meal plans. So take advantage of what this vegetable has to offer, especially in the summer! It’s back to my upbringing for this recipe. 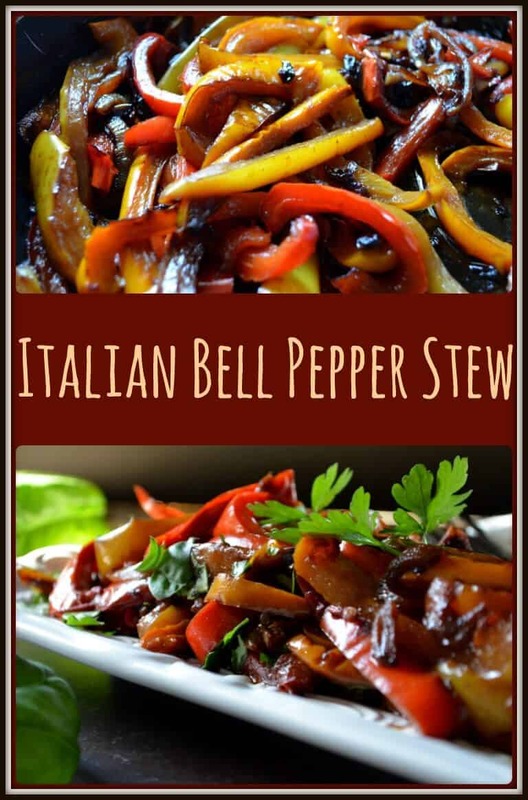 This Italian Bell Pepper Stew Recipe was a weekly occurrence when bell peppers were in season. My mom would prefer to make this recipe with only red peppers. 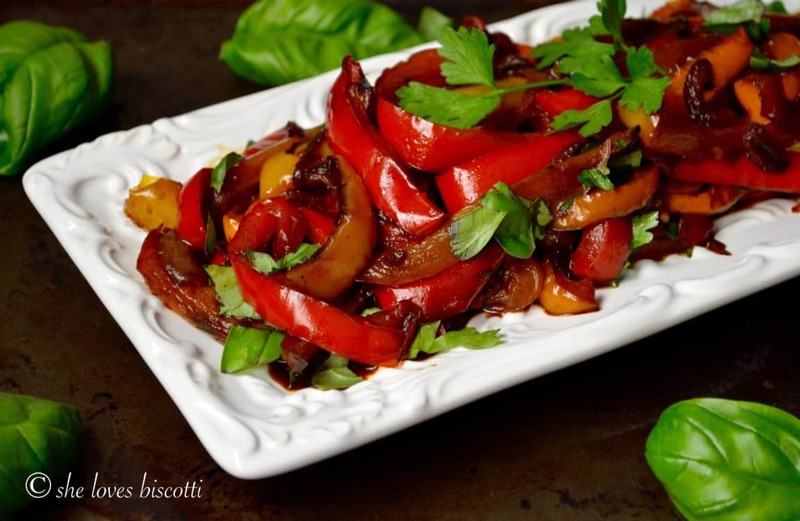 (If you love red peppers, you will also love this Marinated Roasted Bell Peppers recipe). I like to mix in the yellow and orange peppers, because I find it visually more appealing. I guess green peppers can be used in this recipe too, but, come to think of it, I’ve never used them! They aren’t as sweet as red/ yellow/ orange peppers, so you can decide if you want to include them or not. It never ceases to amaze me how different regions in Italy (and sometimes adjacent cities) will have slightly different variations of the same basic recipe. With this peperonata recipe for example, some regions will incorporate tomatoes in the stewing process – if you’re interested in such a recipe, I encourage you to head on over to JovinaCooksItalian. Jovina’s regional recipe also includes some heat! I was inspired by Jovina’s recipe and included wine at the end of the cooking process. As you can see, the basics of a peperonata are all the same. The difference is usually one or two ingredients and sometimes the methods and cooking time. 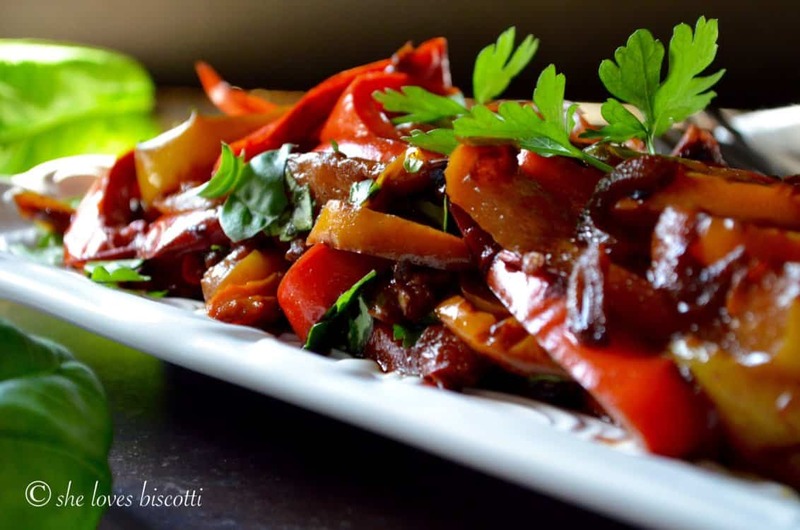 With or without tomatoes, this Italian Bell Pepper Stew Recipe is an easy dish to prepare as a side or as part of your appetizers. Do you have another variation of this Italian classic? Would love to hear about it! Peperonata or Italian Bell Pepper Stew is a traditional Italian recipe where bell peppers and onions are simmered together to create a tasty dish. This family recipe for peperonata can be served as an appetizer, side dish, sauce for pastas, pizza topping or snuggled in a sandwich. Heat the olive oil in a large frying pan (over medium-high heat). 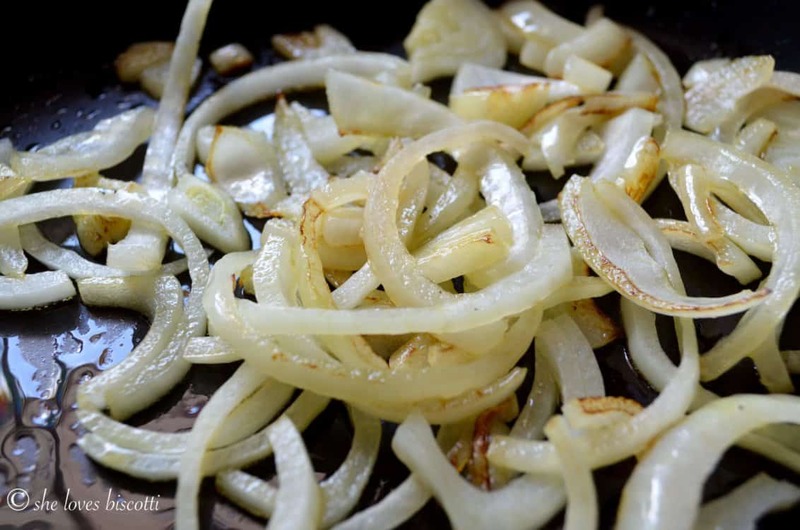 Add the sliced onions and sauté until onions soften (reduce to medium heat). Add the whole cloves of garlic. Add the sliced peppers all at once over the onions. Do not stir. Cover your pan and let the mixture stew together for about 10 minutes. Every once in a while give your pan a shake. When the peppers have softened, add the red wine and simmer on medium heat for about 5-10 more minutes, uncovered. Add parsley, basil, and season to taste. If you are a fan of hot peppers, you can easily add one to this recipe. 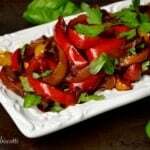 LOVE THIS PEPERONATA RECIPE? PIN IT TO YOUR SIDE DISH AND VEGETABLES BOARD! Maria, I cannot wait to try this! I’m not joking when I say I have 6 fresh peppers in my fridge right now. I would love this with some goats cheese on crostini. I think it might be on the docket for this weekend! Love love sweet bell peppers! I actually made them last night with my favorite tuna/capers filling 🙂 . Peperonata is something I grew up with, and you are so right about the differences from Region to Region (and sometimes even in the same Region 😉 ). My dad, for example, always added the summer garden vegetables to his peperonata, so there were a lot of peppers, but also potatoes, zucchini, and tomatoes. Nothing like a simple Italian dish where the veggies shine through! plus wine always kick it up a notch! Lovely recipe! This sounds incredibly tasty! I love the versatility of it, and also that it’s an easy way to add a little bit extra nutrition to almost anything, like sandwiches! I love love love the smell of onions and peppers simmering and crackling in a pan at the same time. I’ve always plopped them into tortillas with cheese to make fajitas, but I’ll have to keep them as a side sometime! I could eat this every day of the week! Yum! Our family loves peppers! Those peppers are gorgeous and this is the perfect time of year to make this dish.